Yes, this is really vegan! 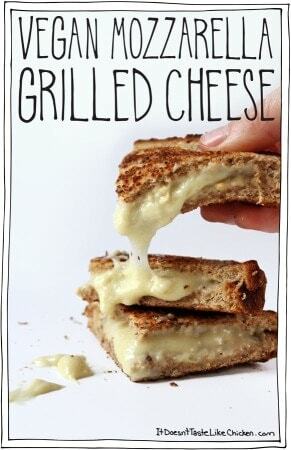 Vegan Mozzarella Grilled Cheese sandwich where have you been all my life? The cheese only takes 15 minutes to make and is so melty and stretchy. Yum! Butter one side of each of the slices of bread. Take three of the slices and divide the Melty Stretchy Gooey Vegan Mozzarella evenly among them. Top the bread with the remaining three slices of bread, butter sides out. Heat a pan over medium heat, and grill the sandwiches until they are golden brown on the bottom. Flip each sandwich and brown on the other side. Make sure the sandwiches are heated through. Super secret tip: as the sandwiches are cooking, I like to use a spatula to squish around the outside of the sandwiches, compressing the crusts together. This makes a sort of seal and traps all the melty goodness inside. Yum!